Much is written of this legendary group of individuals, particularly in the life and times of their greatest leader Fionn MacCumhaill (pronounced Fy-unn MacCoo-ell). Entrance to the Fianna was extremely difficult, with the physical tests being almost impossible for most mortals, and the mental and devotional requirements making the life one of total sacrifice and dedication to the High King's throne. So often-times, the Fianna's role was to maintain the peace, between warring factions. Their much heralded valor and recorded achievements are as much a matter of folk-lore as history, but several historical moments have been well documented and related to us in the native Irish verse. The Fianna, under the leadership of Fionn, flourished. There are many tales of victorious battles against the invading Norse, and of battles against the armies of Ulster and Connaught. 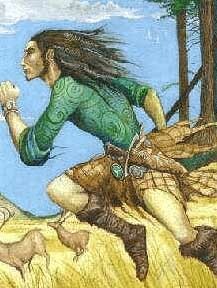 Renowned cohorts to Fionn, in these times, were Caoilte , Diarmaid, Oisin, and Goll MacMorna. Many of the stories of the Fianna recount tales of bravery, honour, revenge, love, and loyalty, and this band of warriors became the standard by which other warriors were measured. The Kennel Club rejected the spelling of Caoilte but accepted Caoilta, (pronounced quail-ta) as my affix.